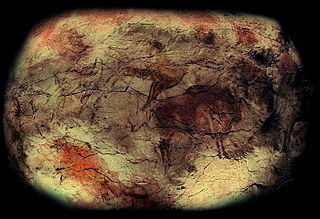 Cave painting of a Megaloceros in Lascaux. Polished stone axe - Muséum de Toulouse. Cairn of Barnenez is one of the World's oldest monumental grave. Reconstruction of a Celtic house. 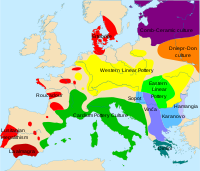 A simplified map, ca 1200 BC, showing the central Urnfield culture (red), the northern Urnfield culture (orange), the Knoviz culture (blue-gray), the Lusatian culture (purple), the Danubian culture (brown), the Terramare culture (blue), the West European Bronze Age (green) and the Nordic Bronze Age (yellow). The green area suggests a possible extent of (proto-)Celtic influence around 1000 BC. The orange area shows the region of birth of the La Tène style. The red area indicates an idea of the possible region of Celtic influence around 400 BC. ^ a b Jones, Tim. "Lithic Assemblage Dated to 1.57 Million Years Found at Lézignan-la-Cébe, Southern France «". Anthropology.net. Retrieved 21 June 2012. 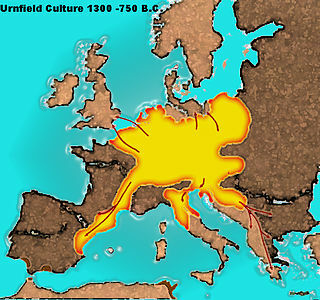 The Urnfield culture was a late Bronze Age culture of central Europe, often divided into several local cultures within a broader Urnfield tradition. The name comes from the custom of cremating the dead and placing their ashes in urns which were then buried in fields. 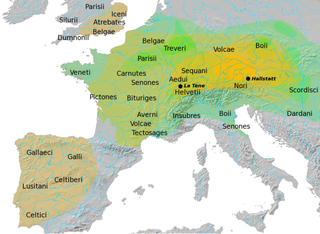 Over much of Europe, the Urnfield culture followed the Tumulus culture and was succeeded by the Hallstatt culture. Linguistic evidence and continuity with the following Hallstatt culture suggests that the people of this area spoke an early form of Celtic, perhaps originally proto-Celtic. The Tumulus culture dominated Central Europe during the Middle Bronze Age. 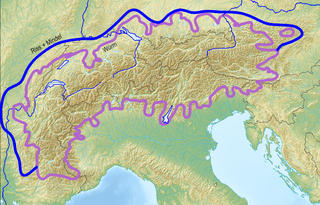 The Riss glaciation, Riss Glaciation, Riss ice age, Riss Ice Age, Riss glacial or Riss Glacial is the second youngest glaciation of the Pleistocene epoch in the traditional, quadripartite glacial classification of the Alps. The literature variously dates it to between about 300,000 to 130,000 years ago and 347,000 to 128,000 years ago. It coincides with the Saale glaciation of North Germany. The name goes back to Albrecht Penck and Eduard Brückner who named this cold period after the river Riss in Upper Swabia in their three-volume work Die Alpen im Eiszeitalter published between 1901 and 1909. This page concerns the prehistory of Brittany. Bronze Age Britain is an era of British history that spanned from c. 2500 until c. 800 BC. 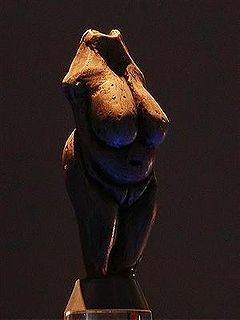 Lasting for approximately 1,700 years, it was preceded by the era of Neolithic Britain and was in turn followed by the period of Iron Age Britain. 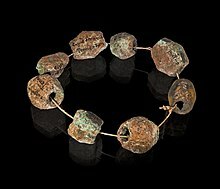 Being categorised as the Bronze Age, it was marked by the use of copper and then bronze by the prehistoric Britons, who used such metals to fashion tools. Great Britain in the Bronze Age also saw the widespread adoption of agriculture. The caves of Arcy-sur-Cure are a series of caves located on the commune of Arcy-sur-Cure, Burgundy, France. Some of them contained archaeological artefacts, from the Mousterian to Gallo-Roman times. Betal Rock Shelter, a karst cave located on the south-eastern edge of the Lower Pivka river valley on a slope just above the road from Postojna to Bukovje is a site, where rich cultural sediment layers with remains of stone tools, artifacts and numerous fossilized bones of contemporary animals were found. Its entrance has been formed by the collapse of the 174 m (571 ft) long cave's ceiling, carved out by the waters of the Pivka river.